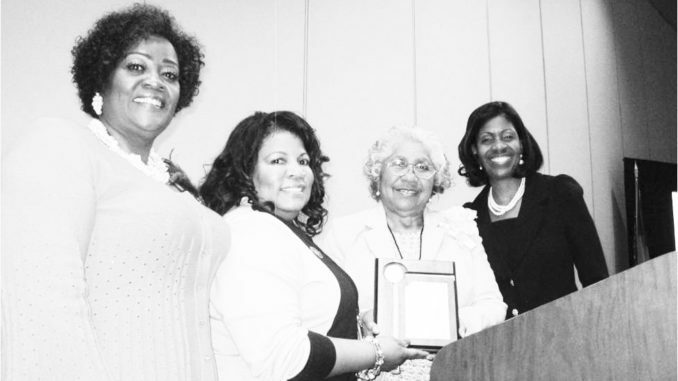 Pictured from left to right is Sharon Brown Harriott, Regional Director, Clorinde Miller, Chapter, Pi eta Chapter President, Thelma Mosley, Former Cluster Coordinator, and Rose Dean Andrews, Cluster Three Coordinator. Alpha Kappa Alpha Sorority, Inc., Pi Eta Omega chapter recently attended the 40th session for Cluster III in Jekyll Island, Georgia. Cluster III comprises 10 chapters in the North Florida Region and South Georgia. Specifically: Brunswick, GA; Waycross, GA; Jacksonville, FL; Orange Park, FL; Deland, FL; Daytona Beach, FL; Sanford, FL; Ocala, FL; Palm Coast, FL; and Gainesville, FL. More than 250 members of the Sorority gathered to celebrate HCBU’s, and raise money for the Sorority’s scholarship program and receive updates on the International Programs of the Sorority. The Pi Eta Omega chapter received the Thelma Mosley Graduate Attendance award for the largest percentage of their chapter members attending the Cluster Meeting.